Regulatory policy and practice, however, aren’t global. U.S. government crash standards, for example, require car makers to take into consideration the potential harm to passengers who aren’t wearing seat belts when designing the crash-safety features of their cars. European governments assume that everyone riding in a car is wearing a belt — a standard that’s easier and less costly for car makers to meet. 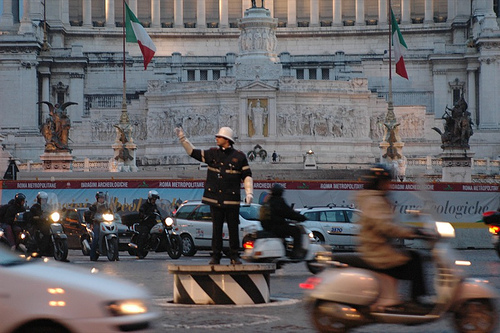 They may simply be there to “preserve the existing disorder,” but Rome, for the first time, is adding female traffic cops in the Piazza Venezia. But, as happened in Mexico City with “the swans,” their appearance may augur a reduction in corruption and an improvement in traffic safety. Comments Off on Putting a Woman on a Pedestal. Click here to leave a comment.